Elements Applied: The fruit is commonly applied in herbal medicine. Active Components: Bilberry containes a bioflavonoid complex, called anthocyanosides, which are known for their antioxidant activity. They participate in the process of connective tissue production and make the blood vessels stronger. Anthocyanosides are also helpful in improving blood circulation. History: Plant’s dried leaves and berries are effective in a wide range of cases, like kidney stones, and other urinary organ disorders, as well as scurvy. Diarrhea prevention is probably the most popular historical usage of the herb. Contemporary studies have been triggered by bilberry’s popularity during World War II, when it was applied by pilots to increase their visual abilities at night, in order to progress in night fights in the air. Conventionally, both dried berries and leaves were applied for curing diarrhea. Berry decoction was widely implemented in case of fevers. Berry juice was applied in form of mouthwash or gargle for catarrh. Bilberry extracts produce a characteristic antibacterial effect on vaccinia, influenza, and herpes simplex virus II. It is also believed to be effective in other fungal and bacterial infections. It is potent of inhibiting protozoans, like Trichomonas vaginalis. Bilberry produces a strong anti-inflammatory effect. Anthocyanins it contains are effectively used to strengthen vessels and prevent platelet accumulation. According to animal researches, it has been effective in preventing angina reappearance, and curing thrombosis. Additionally, it reduced bad cholesterol levels in the blood of animals, preventing atherosclerosis. Bilberry also neutralizes the effect of histamine, makes eyesight better, and may be applied as an aid for pigmentary retinitis. Used For: Bilberry may be applied in a range of conditions: varicose veins, retinopathy, night blindness, macular degeneration, diabetes, poor circulation, cataracts, bruising, and atherosclerosis. According to recent studies, bilberry is potent of healing ulcers, and preventing their appearance as well. It has been revealed to act positively on animals exposed to cancer. Applied for treating diabetes, bilberry regulated sugar levels in blood of animals and humans, as well as controlled vessel collagen thickness. Additional Info: Being similar to American blueberry in its characteristics, bilberry can be found in the US, Canada, and Europe. Its berries are applied in herbal medicine. Vital components can also be found in the leaves. 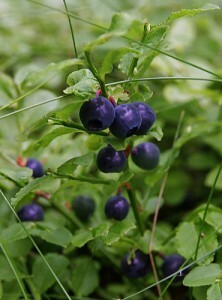 Bilberry belongs to perennials and grows in form of a shrub. It is commonly met in the dry regions of Northern America, and European forests. Its green stem with multiple branches rises from the rhizome and may reach 1-1.5 feet high. The leaves are ovate in their shape, green-colored and have up to 1 inch in length. Pink or red-colored flowers blossom at the end of spring or the beginning of summer. Bilberry berries are bluish or black, and even red in some areas. The fruit contains five seeds. Preparation and Intake: The commonly used dose of dry bilberry extract in pills or capsules is 250-500 g a day, with concentration of anthocyanosides equaled to 25 percent. The quantity of dried berries taken is 1 teaspoon with a glass of water, one cup a day. In form of tincture the herb is taken in a quantity of 15-40 drops diluted in water, thrice a day or when necessary. Safety: When taken in suggested doses the herb is harmless for the organism. There are no cases of bilberry interaction with other medicines, and its safety during breastfeeding or pregnancy is guaranteed. If applied for a prolonged period of time, the leaves may show signs of poisoning.